Evolve Additive Solutions announced a technology partnership with Eastman Kodak to leverage the latter’s imaging systems, parts, and consumables based on the KODAK NEXPRESS digital electrophotographic platform. In addition to the partnership, both the companies also entered into a Joint Development Agreement (JDA) for concerned equipment and materials to further develop STEP, Evolve’s proprietary 3D printing technology. The STEP 3D printing technology is planned to be commercially unveiled in 2020 and the partnership will boost its subsequent efforts for the launch. Selective Thermoplastic Electrophotographic Process (STEP) 3D printing technology is patented by Evolve Additive Solutions which is a spin-off company of Stratasys. This technology is promoted as being the first truly mass manufacturing 3D printing technology offering an alternative to injection moulding and other traditional manufacturing processes. Evolve has combined an existing time-tested 2D printing technology with its own proprietary STEP platform that truly enhances the additive manufacturing technology well beyond the existing traditional manufacturing technologies. It is claimed to have a scalability, speed, cost, and quality on par with injection moulding and an even better manufacturing and material flexibility. Eastman Kodak is the pioneer in its work on electrophotographic technology since the past 40 years. The (acclaimed) KODAK NEXPRESS Platform delivers unique print capabilities in a modular and upgradeable package, making it an ideal platform for Evolve to leverage and transform into a leading production technology for additive manufacturing. Evolve will be utilizing a Kodak-developed toner manufacturing process to make the part toners for the Evolve system. The electrophotographic technology is part of the whole solution comprising hardware, materials, processes, workflow software, and services required to print and finish parts cost-effectively at high quality and high speed. Collaboration and cross-fertilization of ideas between the two teams is expected to reach beyond materials and components to manufacturing, service, and support. Kodak is a technology company focused on imaging. It has been a pioneer in imaging systems. Kodak has also expanded into the 3D printing industry with its own range of 3D printers named Portrait. An R&D project launched in 2009 by industry leader and pioneer Stratasys, Evolve has spun out as its own company and technology leader. 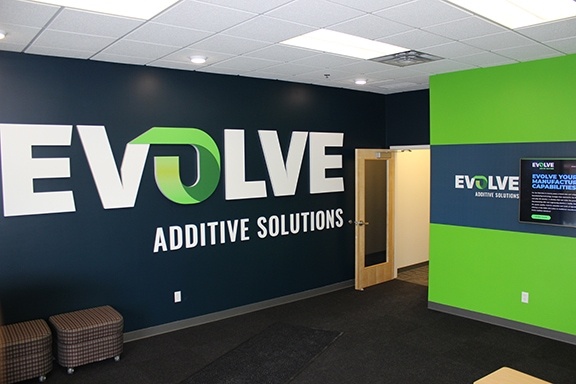 Evolve Additive Solutions now is a Minnesota–based company which develops innovative manufacturing solutions that enable customers to manufacture in revolutionary new ways. It has developed its own proprietary 3D printing technology named STEP.